Bee Wolf Ray is a passionate, professional astrologer, dreamwalker and tarot / oracle card reader with a unique and insightful approach. 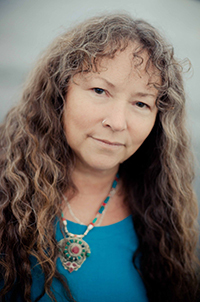 Bee can be found on Hornby Island at the Farmer's Market in summer and at various Vancouver Island Spirit Fairs.She is available for readings via Skype or in person. She writes a blog here. She is the author of a popular local monthly horoscope column in the Island Word. Astrology is a symbolic language designed to describe many levels of reality. What distinguishes astrology from the sciences is that it includes the mental, emotional and spiritual aspects of life, which are not empirically measurable. When we understand the forces that are being exerted on ourselves and others, we can understand the 'why' of our own behavior. What we experience as dysfunctions are often natural consequences of ways we fight the very forces that shape us. When we know this, we are freed from the need to fight those forces. When we fight ourselves, the behaviors we resist fight back, becoming warped and strained. When we accept ourselves, we can express all our qualities with enjoyment. All of ourselves, the dark and the light, is included in the wholeness necessary to life. Once we understand the serpent part of ourselves, we can both accept it and protect others from its sting, we become safe partners, parents and citizens. Painful developmental cycles can be tracked and understood through transits and progressions. When we place our pain in a meaningful context, we no longer feel victimized by random events. When we understand the timing, meaning and purpose of our experiences, we can develop workable strategies, to make the most of difficult times, not simply to 'get through them,' but to reap the benefit of the lessons they offer. To know is to love. When you truly know yourself, you will accept yourself instead of fighting and punishing yourself. When you truly know your beloveds, you will love them even more. Behaviors that once infuriated you become indicators of their specialness, distinct from you, with differences worthy of respect. Two people may love each other deeply and share very different emotional needs. Sometimes, this difference can indicate that a life together is not sustainable. Often, though, simply understanding the other and accepting their needs as part of who they are (and not something they do to be annoying or oppositional) is enough to release our conditions and open our hearts. Should a child be home schooled? Or do they need the social milieu of school? Do they have a latent gift or talent that can be encouraged (but never forced) while they are young? Which sorts of discipline are most likely to damage them and which most likely to produce positive results? What sort of diet will they best thrive on, do they need a lot of cuddles and touch, what might they ask for if they had the words? EarthMatrix can also help parents understand how they may hurt their children without meaning to, particularly if the child has a difficult Moon, Saturn or Pluto by position or aspect. Some pains are necessary to help us grow. Childhood lays the foundation for our lives; our traumas and turmoils originate there. We cannot change the nature of childhood, but we can learn to give our children what they really need, and to give them space to develop healthy selves distinct from their parents.